Will this be the next organic grocer to be acquired? 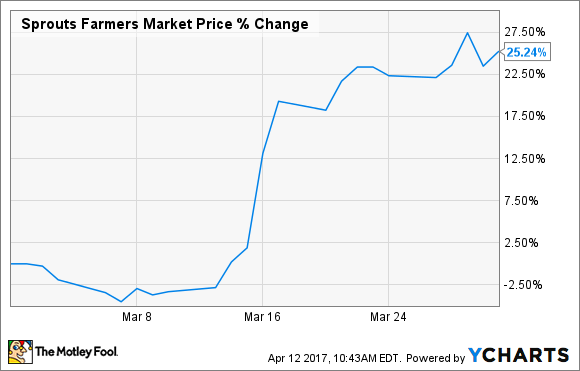 Shares of Sprouts Farmers Market (NASDAQ:SFM) soared 25.2% last month, according to data provided by S&P Global Market Intelligence. The organic grocery store chain's stock rocketed higher on rumors of a potential acquisition by Albertsons Cos., the industry titan controlled by Cerberus Capital Management. Bloomberg first reported the news on March 19. Interestingly, Sprouts' shares rallied sharply in the days prior to Bloomberg's report, raising questions that some investors may have had knowledge of the talks between Sprouts and Albertsons before the news broke publicly. Still, with Sprouts' stock currently trading at around $23 per share -- basically the same as where it ended March -- there could still be significantly more upside if a deal is completed. In fact, analysts have suggested that Sprouts could fetch as much as $26 a share, which would represent upside of more than 13% from today's prices. Organic grocers are in many ways victims of their own success. The high demand for natural and organic foods has brought about intense competition from traditional grocers, as well as major discount retailers such as Wal-Mart and Target. This competition has pressured Sprouts' margins and dampened its growth potential. In this difficult market environment, an acquisition by a larger competitor such as Albertson's could be a blessing for Sprouts' shareholders. Such a deal would likely see Sprouts Farmers Market taken out at a premium above even today's heightened prices, and investors could then look to redeploy their capital in more promising long-term opportunities.